Google Buzz is just becoming more and more useful especially if you are a blogger. Thanks to the awesome people who Your Web AddiCT has been interacting with on Google Buzz many awesome ideas have been sparked or built upon. Many ideas for blog post which are relevant to you have also been found from the wonderful wwworld of Google Buzz. Compared to twitter there is just so much more valuable information available in larger chunks (>140 characters). The following 9 Google buzz tips are perfect for many of us who are new to Google Buzz and also if your are a WordPress blogger. 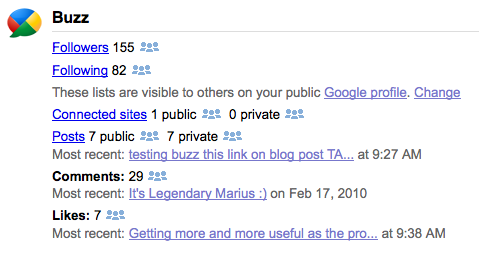 View a summary of your Google Buzz activity on your Google Dashboard. Format your posts. When posting in Buzz, you can format text just as you can in Gmail chat: *bold*, _italics_, or –strikethrough– all work. Use an @reply to send a post directly to someone’s inbox. If you want to make sure one of your friends sees a certain Buzz post, you can direct it to their inbox with an @reply. Type the “@” symbol followed by the first few letters of their name, and select their email address from the list. Only you’ll see their Gmail address — other people will just see their name. Mute posts so they don’t get sent to your inbox. Fore more information on these tips and other Google Buzz help visit the Help Center in Gmail. Add Google Buzz button to your posts on a wordpress blog with the Google Buzz This button. Add a Google Buzz widget to your sidebar with the Google Buzz Feed wordpress plugi. My personal favourite which you can see in the sahre this section of every post on this blog: WP Google-buzz. Beautiful Google buzz integration to wordpress + admin panel options (Settings -> WP Google-buzz) + 11 diff button images + mouse over effects. Automatically displays Google Buzz button for every post and pages. Use Google Maps mobile? When you update your status with Google Maps mobile (Latitude) it automatically becomes a buzz with your location.